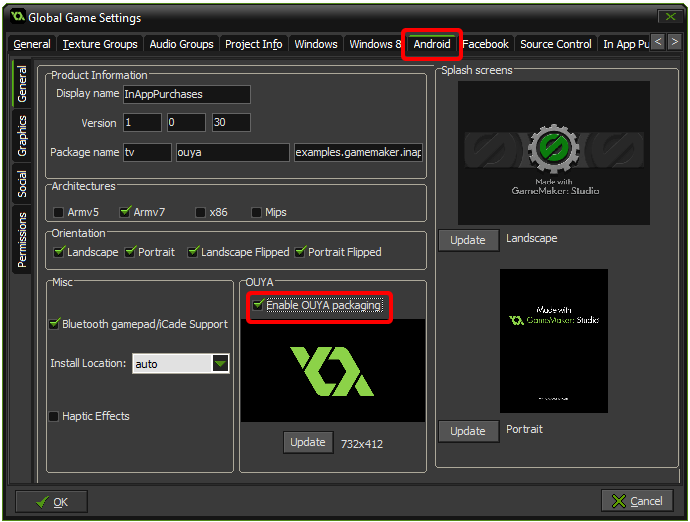 GameMaker-OuyaSDK-Extension - Enable OUYA Everywhere Input and In-App-Purchases in GameMaker Studio. The GameMaker Extension is compatible with the last (pre-gradle release) GMS 1.4.1657 which can be downloaded from the release notes page. You may need to downgrade to this version if the auto-upgrader patched to a newer version. In your project's Global Game Settings, on the Android tab enter your Package name matching the developer portal and check Enable OUYA packaging. Import the OuyaSDK Extension and be sure to download your signing key from the developer portal and place into the extensions/OuyaSDK/key.der project subfolder. Select the Android target and use the File menu and select the Create Application menu item to build and deploy to the connected ADB device. The Ouya-GameMaker-Extension is available in the releases section. GameMaker extension methods only use String and double for parameters and return types. The signing key from the developer portal should be placed in the extensions/OuyaSDK/key.der project subfolder. Edit the game icons in the Global Game Settings. In the Project View, right-click on Global Game Settings and choose Properties. On the settings Android tab be sure to Enable the option for Enable OUYA packaging to be able to set the store icon in the GUI. And click OK to accept the changes. To enable the leanback icon, use the menu item Help->Open GameMaker in Explorer to manually edit the icon setting in the manifest. Navigate to the GameMaker-Studio\Android\runner\AndroidManifest.xml folder and open in a text editor. And the android:logo="@drawable/banner" to the application element and save the changes. Enable support for the leanback icon by setting the min platform to API 16: Android 4.1 (Jelly Bean) and the target platform to API 21: Android 5.0 (Lollipop). Place the game leanback icon in the extensions\OuyaSDK\AndroidSource\res\drawable\banner.png project location. The folder will need to be created if it does not exist within the project. The leanback icon should be 320x180. The OuyaSDK extension uses OUYA-Everywhere Input which gets the input remapping for supported and future devices. 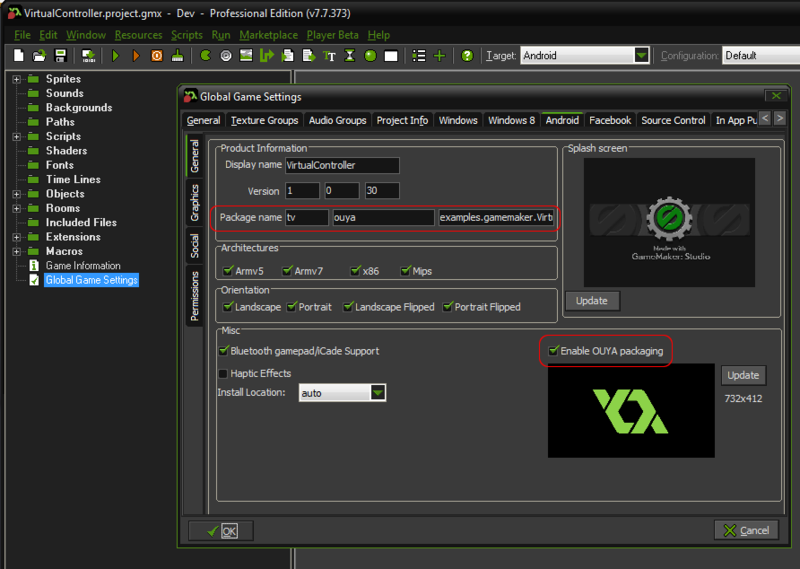 GameMaker automatically adds an extension entry in AndroidManifest.xml when the OuyaSDK extension is added. Without the entry, the extension methods will not be invoked. OuyaSDK_IsInitialized returns true if the OuyaSDK extension has been initialized. Axis input can be obtained through OuyaSDK_GetAxis. The playerNumber values "0", "1", "2", and "3" are expected for the first String parameter. The axis values from below are expected for the second String parameter. All the axis values for Controller #1 (0) can be obtained with the following code. Button input can be obtained through OuyaSDK_GetButton. The button values from below are expected for the second String parameter. 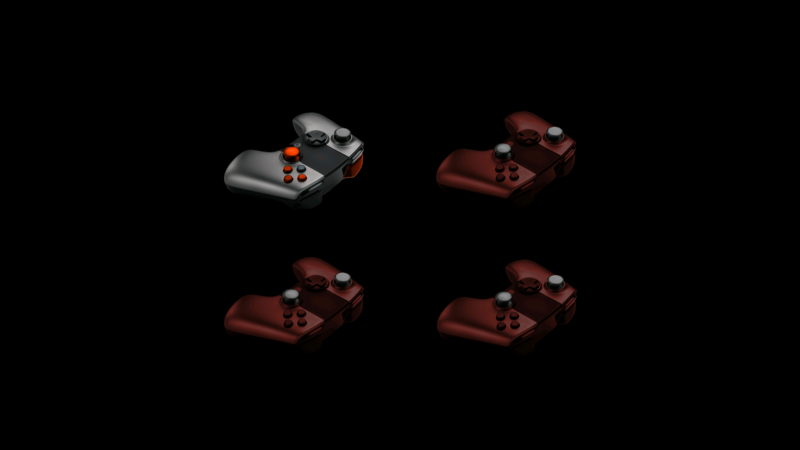 All the button values for Controller #1 (0) can be obtained with the following code. Detecting the Menu button should use OuyaSDK_GetButtonDown or OuyaSDK_GetButtonUp. The button values from above are expected for the second String parameter. OuyaSDK_GetButtonDown returns true when the button detected a pressed event. OuyaSDK_GetButtonUp returns true when the button detected a released event. OuyaSDK_ClearButtonStatesPressedReleased should be called at the end of the Update event each frame to clear the detected pressed and released states. 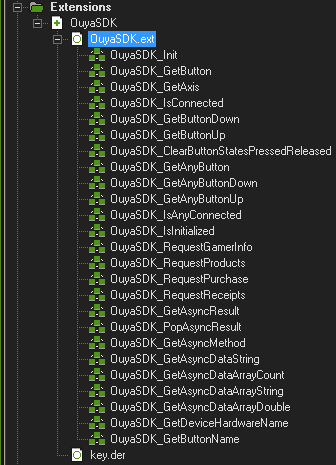 OuyaSDK_GetAnyButton returns true if any controller is in the pressed state for the button String parameter. OuyaSDK_GetAnyButtonDown returns true if any controller had a pressed state event in the last update frame for the button String parameter. OuyaSDK_GetAnyButtonUp returns true if any controller had a released state event in the last update frame for the button String parameter. OuyaSDK_IsConnected returns true if the playerNum first String parameter is connected. OuyaSDK_IsAnyConnected returns true if any controller is connected. OuyaSDK_GetAsyncMethod is used to get the async completion result from async methods called in the OuyaSDK extension. Async completion results sit on a stack and OuyaSDK_GetAsyncMethod gets the method name from the current completed result. OuyaSDK_GetAsyncResult will return a JSON string about the method and data corresponding to the async completion result. When all the details are extracted from the completion result, invoking OuyaSDK_PopAsyncResult will move on to the next completion item. There are various helper methods for accessing the JSON data for the async completion result. All async completion results have a string method and a data object. OuyaSDK_GetAsyncDataString - Returns the string value for the completion data given the string field. OuyaSDK_RequestGamerInfo is an async call that provides access to the GamerInfo which has the gamer's uuid and username. OuyaSDK_GetAsyncMethod will return onSuccessRequestGamerInfo or onFailureRequestGamerInfo when the request has completed. OuyaSDK_RequestProducts is an async call that provides access to the Product details. The first parameter is a string comma separated list of identifiers. OuyaSDK_GetAsyncMethod will return onSuccessRequestProducts or onFailureRequestProducts when the request has completed. OuyaSDK_RequestPurchase is an async call that requests purchase of a Product. The first parameter is a string which is a Product identifier. OuyaSDK_GetAsyncMethod will return onSuccessRequestPurchase, onFailureRequestPurchase or onCancelRequestPurchase when the request has completed. OuyaSDK_RequestReceipts is an async call that requests all the entitlement purchases on the server. OuyaSDK_GetAsyncMethod will return onSuccessRequestReceipts, onFailureRequestReceipts or onCancelRequestReceipts when the request has completed. 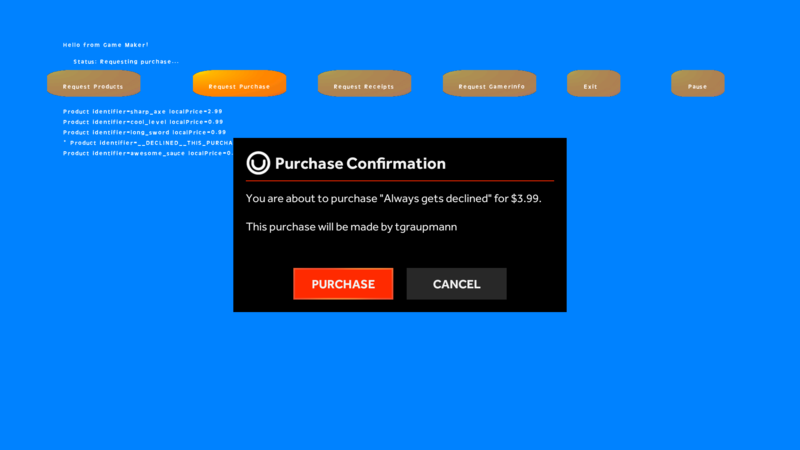 The In-App-Purchase example uses the ODK to access gamer info, purchasing, and receipts. 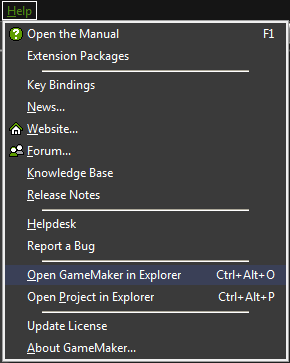 To edit the AndroidManifest.xml you'll need to open the folder using the Help menu and select Open GameMaker in Explorer. Navigate to GameMaker-Studio-Dev\Android\runner\AndroidManifest.xml. Xiaomi's SDK requires several additional permissions in AndroidManifest.xml in order to work. For the Xiaomi build, make sure that the Android android:targetSdkVersion is set to 16. OuyaSDK_Init supports initialization strings to make the game compatible with OUYA Everywhere devices. By using the OuyaSDK Extension the Xiaomi screensaver will be disabled automatically.